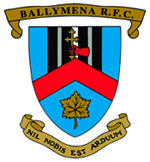 As is necessary to survive in the present era of professionalism in rugby, over the past number of years Ballymena have negotiated a series of lucrative major Sponsorship deals, first with Clerical & Medical, then with Cable & Wireless, who remained Club major Sponsors for 6 years. They were in turn replaced by Michelin Tyre plc, and the latter by the Patton Group. Present Major Sponsors are Galgorm Resort and Spa. Strain Engineering, Moy Park, Colliers International, Charles Hurst Group, Warwick Engineering, McCue Crafted Fit and Ballymena Borough Council are among a large number of subsidiary Sponsors of the Club, with Canterbury C.C., in association with Style ‘N’ Sport, the main Kit Sponsors.